Before Summer 18, to read parameter in Lightning Component, we had to wrap Lightning Component in Lightning Application. After Summer 18, it has changed for good. In this blog post we would create a formula field to launch Lightning Component (yes, you read it right). And then we would read URL parameter in Lightning Component using pageReference provided by interface lightning:isUrlAddressable. 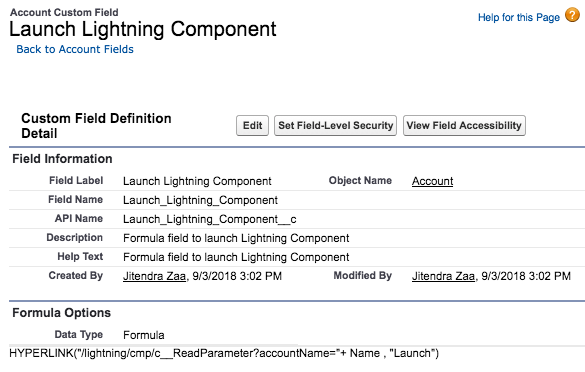 Create a formula field on Account to launch Lightning Component and read its parameter. Thanks so much Jitendra, really useful article. Will the formula field work in Salesforce Classic and salesforce 1 mobile too? It will work only in Lightning Experience as you cannot launch Lightning component directly in classic. You are the guy…who is tired less learner. Is it possible to open this page as a popup, instead of redirecting it to a new screen? 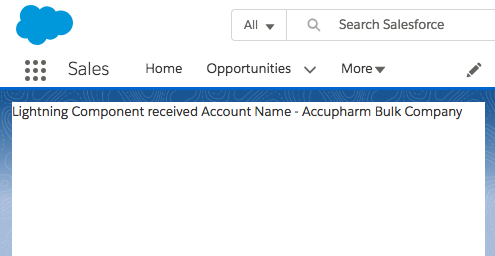 This page isn’t available in Salesforce Lightning Experience or mobile app. It does not work. When you click on the hyperlink of the formula, the page loses the parameter and its reference data.